It has always been important to support our bodies with healthy foods and periodic cleansing to keep our engines tuned. Now, new ways to tap energy allow us to be even more vibrant. For those of us who enjoyed the movie “What the Bleep,” knowing, feeling and accepting energy’s value in our lives is a common trait we share. Others, however, may need to validate things with all five senses before believing them to be possible. 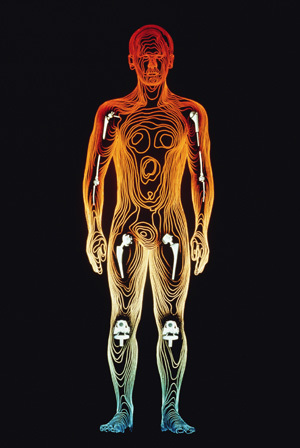 Our bodies have two interesting energy systems: one is visible and one is invisible. The visible one is our nervous system. This system operates all of the body’s functions, from muscles moving to the heart beating and lungs breathing. This system consists of the brain, the spinal cord and all the nerves that branch out to our bodies’ cells. The invisible system is comprised of our acupuncture meridians, which the Chinese divide into 12 channels of energy relating to the organs and two additional ones: the central and the governing. Even though we cannot “see” these meridians, the effects of stimulation with needles to these areas can be profound. In the holistic field, homeopathy is based on the vibrational energy of a substance. The vibration of a substance (such as apis, more commonly known as bee venom) is increased by succession (shaking or pounding) and dilution. The more the substance is diluted in this manner, the more powerful the remedy. In fact, when it is diluted to the point that there is no more substance in the remedy, it becomes increasingly more powerful — which is why it is important to select the right dose for the condition being treated. The newest energy modality to be developed is nanotechnology. With this technology, frequencies can be imprinted into diluted substances (amino acids, at this time). When this substance is placed on the body in the form of little patches, it can increase the body’s strength, endurance and energy. Even though nothing physically enters the body, the body responds to the frequency. We are literally tapping energy by activating the body’s own storehouse. Victoria Bowmann, Ph.D., is a licensed massage practitioner specializing in cleansing and detoxification who has been in private practice in northeast Phoenix since 1978. 602-971-8392 or e-mail: vbowmann@cox.net.